The presence of anthelmintic resistance can be detected in flocks in a number of ways. These vary in terms of their cost, complexity and robustness and are outlined below in terms of this hierarchy, starting with the cheapest and most simple. Post-dosing faecal egg counts (‘Drench Tests’): A quick indication of the efficacy of an anthelmintic can be gauged by laboratory testing faecal samples from 10 sheep following after treatment. The time after treatment depends on the anthelmintic used – it is seven after 2-LV, 10-14 after 1- BZ and 14-16 days after a 3-ML. In practice, this means checking post treatment either seven days for 2-LV or 14 days for 1-BZ and 3-ML products. The test is merely an indicator of anthelmintic inefficacy and not necessarily anthelmintic resistance per se, as many other factors can influence test results. 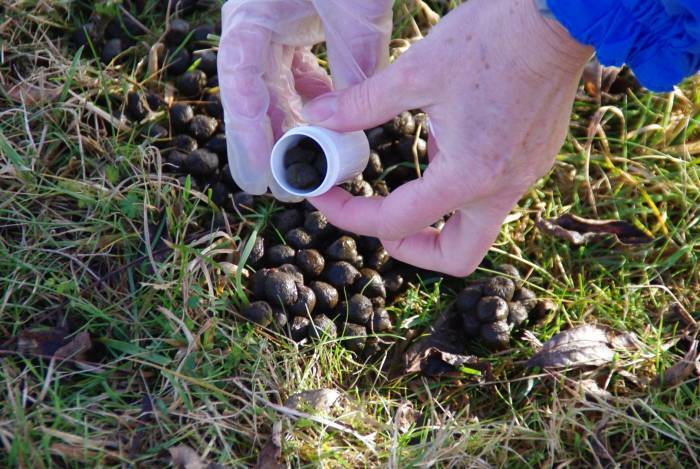 The usefulness of this test is improved if faecal samples from 10 sheep in the dosed group are collected and submitted on the day of dosing, to provide a rough estimate of the reduction in FEC achieved (and to confirm there was a measurable epg before treatment). Larval Development Tests (LDTs) and Egg Hatch Assays (EHAs): A range of in-vitro tests has been developed to avoid the use of animals in testing for resistance. The two most commonly used are the egg hatch assay (EHA) for the 1-BZ anthelmintics, and the larval development test (LDT) for 1-BZ and 2-LV classes. There are currently no in-vitro tests yet available for 3-ML resistance. Farm visits are not necessarily required and the samples can be sent by post direct to the laboratory. However, currently these tests are relatively expensive, precluding their widespread use. Sensitivity is generally considered higher than with the FECRT so AR may be detected when the frequency of resistant alleles within the worm populations is still low. Interpretation is, however, not straightforward and requires expert input. Although not reversible, the presence of anthelmintic resistance is dynamic. Detection on a farm will vary according to season, the worm species present at the time a test was applied and the test’s specificity and sensitivity in detecting resistant alleles within the worm populations. It is important, therefore, not to assume full knowledge of the situation on an individual farm on the basis of one test. Tests should be repeated at intervals and as a part of the on-going monitoring with a health plan in flocks. Download information from the SCOPS Technical Manual on detecting anthelmintic resistance. Collecting dung samples before and after using an antelmintic can show how much worm egg counts have reduced by.